Ever have one of those weeks where the days move slow enough to practically drive you insane. That's the epitome of my week this week. Not to mention how busy it's been. Most days, I don't ever have to leave the house. And I love that. 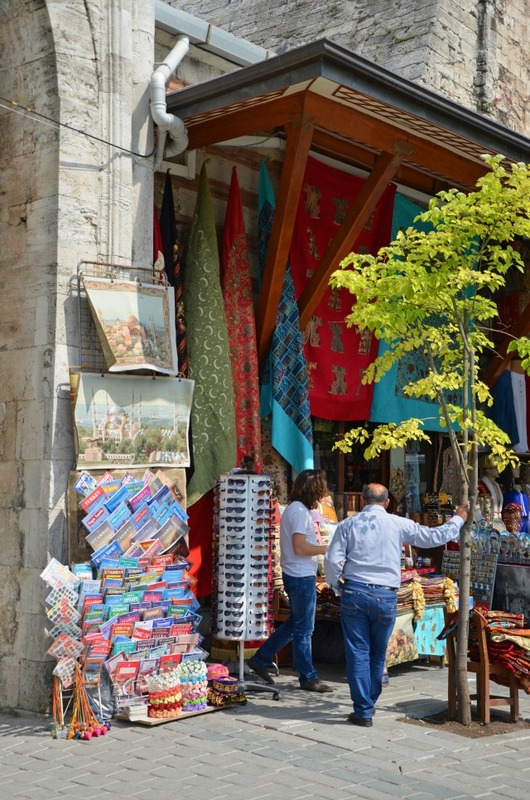 I'm a total home body (all wanderlust aside). This week, however, I've had to actually put real clothes on (not just pajama clothes) and go be a functioning human. I don't like being a functioning human everyday of the week, I've decided. Dogs have it made, ya know? Eat, sleep, poop, roll in said poop...and then do that same combination all over again. I could be a dog...minus the poop rolling, of course. But before I reduce down my own existence to any lower of a species, I guess I should just share with you a few things I found around the internets this week that made my human existence a little less mundane. Really, I just had no original content (or any edited photos) for today. So, you get internet hand-me-downs. You're welcome. I have no idea how I ran across this website, but I'm in love. It's filled with tons of fascinating tidbits about all the random nonsense you've ever wondered about. Like how many spiders do we really eat in our sleep each year? Or why do athletes slap each others' butts? Riveting stuff here folks. Be ready to waste hours of your life contemplating life's most puzzling questions. This one's still boggling my mind. I especially love #3, #6, and #15. Now tell me who's scared that children are our future? I was humming a tune in the kitchen the other day and absolutely could not for the life of me figure out where I'd heard it before. I really didn't even know all the words, just the tune. I started humming it to D and lo and behold he knew some of the words. Just enough for us to figure out it was the TV ad song for Connect Four. You know, that extremely frustrating children's game that's like inverted checkers? Why in the world I was humming it (or even remembered it at all...I guarantee the last time I heard it, I was probably 12), is something to email the writer's at Mental Floss about. But nevertheless, it sparked all kinds of childhood memories that we ended up needing to research via the internet. Thank God for TVadsongs.com, because now I know all the words to the Connect Four jingle and that Folgers Rockapella commercial I never thought I'd hear again. Ahhh, memories. T-minus 3 days until Google Reader is kaput! How are you keeping up with your favorite blogs? And by favorite blogs I mean how are you going to be keeping up with my blog? Don't lie. I know I'm your favorite. ;) I offer a myriad of ways to stay connected with me, so don't say I didn't warn you! That's right, another blog hop. Are you guys sick of these or love them to pieces? I personally love 'em to pieces! If you're trying to grow your blog, they're honestly one of the best (and most fun) ways to do so. I still participate in a handful of blog hops around blog land from time to time and find them extremely helpful in meeting new bloggers and putting my own blog out there. That being said, I've decided to add a little blog hop on to my Fresh Face Friday Feature! Try saying that 5 times fast. I was standing in the shower, sudsing up my hair, and this idea kind of just popped into my brain. Genius via shampoo osmosis maybe? Who knows. But I figured this could be beneficial thing for all parties involved. I'd have my 2 Fresh Face Friday sponsors as my co-hosts, thus driving more traffic and followers their way and would have you, my fabulous readers, meeting new bloggers and gaining followers of your own...without making you link up a specific prompted blog post. The premise is simple: just follow the co-hosts, link up your blog homepage, bloglovin page, facebook page...however you want to showcase your creative space...make new connections, and spread the word! BOOM. Blog hop accomplished! Meet you here in July 12th for the first go-round? I'll be the one wearing a huge smile. :) And if you want to get in on being featured as one of my Fresh Faces with the NEW BLOG HOP CO-HOSTING OPTION, then go here and make all your sponsorship dreams come true! 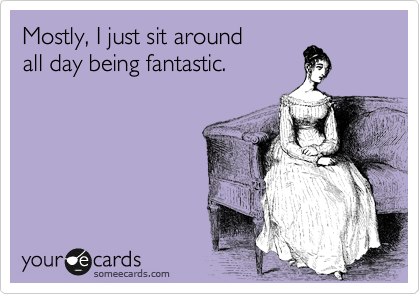 Now, go forth and be functioning humans this glorious Thursday. Just one day till Friday! If I can do it, you can do it, folks. Labels: Blog Hop, Blogging, Life, Misc. The next stop on our tour of Istanbul was the Basilica Cistern, another 'must-see' sight on my list. 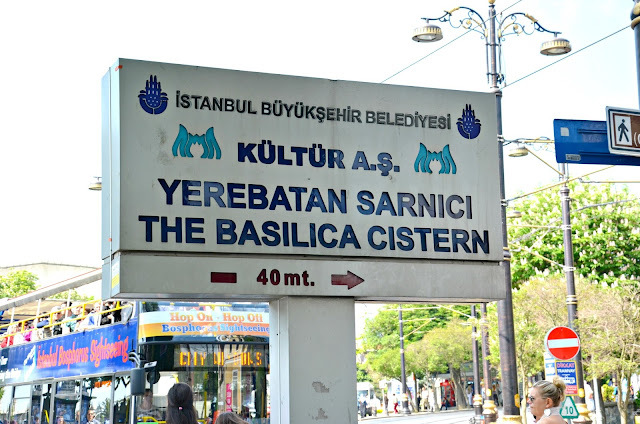 The Yerebatan Sarnici ("Sunken Palace") as it's know by the locals, is the largest of several ancient cisterns that lie underneath the city of Istanbul. 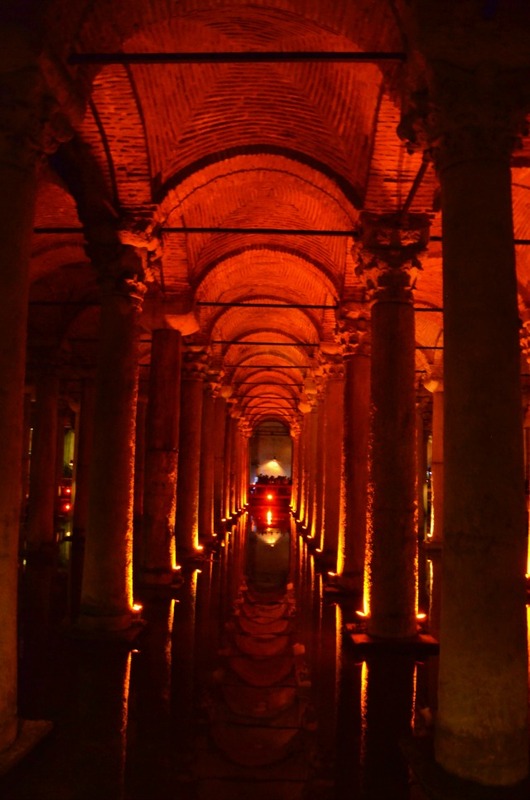 Constructed in the 6th century and then forgotten about for many centuries thereafter, the Basilica Cistern, a former underground Roman public building, was used to supply much of the water used by all of the Byzantine Places in Istanbul. After remaining untouched for years, the cathedral-sized cistern was rediscovered by Frenchman Peter Gyllius in 1545. Since its rediscovery, the cistern has undergone a number of renovations, most notably by sultan's whose palaces the cistern supplied with water. 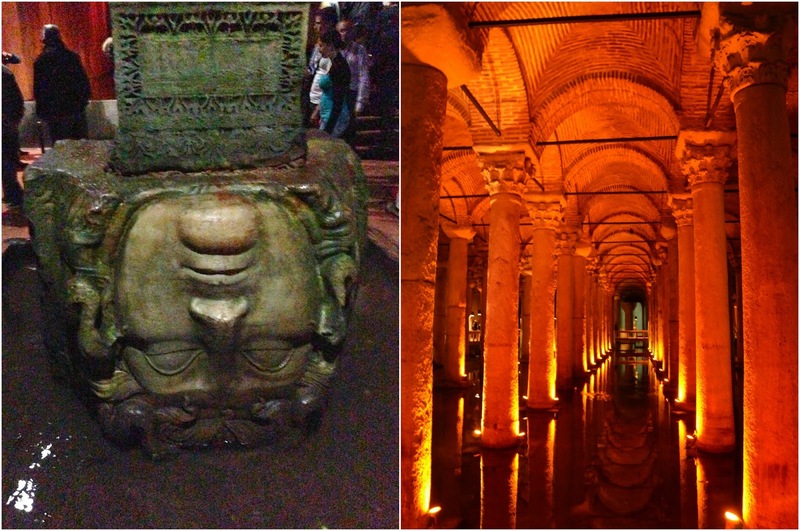 In 1987, after 2 years of renovations by the Istanbul Metropolitan Museum where 50,000 tons of mud had been removed and wooden walkways added, the Basilica Cistern was finally open to the public for visitation. The cistern itself is quite impressive. The light bouncing off the 336 marble columns creates an eerily romantic ambiance, and the cool, clammy underground air provides a nice reprieve from the summer sun outside. Occasionally you'd feel a drop of water falling from the vaulted ceilings and could see fish swimming around the base of the columns, but one of the most fascinating parts of this underground wonder is the upside-down heads of Medusa that form the base of two columns in the Northwest corner of the cistern. The origin of the two heads is unknown, but they were definitely not an original fixture of the cistern when it was first established. It is speculated that the two heads were brought to the cistern after being removed from an old Roman building. Interesting how Byzantine builders thought Roman relics to be no more than reusable rubble, huh? Legend has it that the orientation of Medusa's heads (one inverted and the other lying sideways) were strategically placed so as to negate the power evil forces. Thankfully, no evil spirits were found during our cistern tour, so I guess it's working. 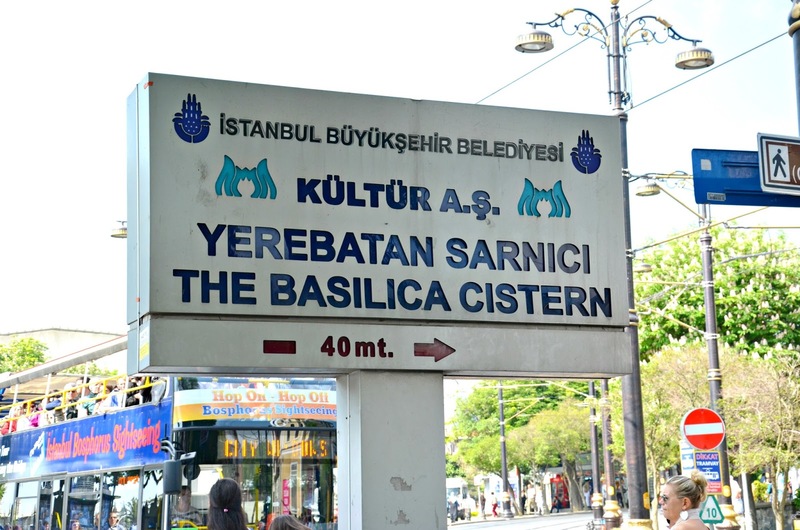 More info on the Basilica Cistern's location, opening times, and entrance fees can be found here. 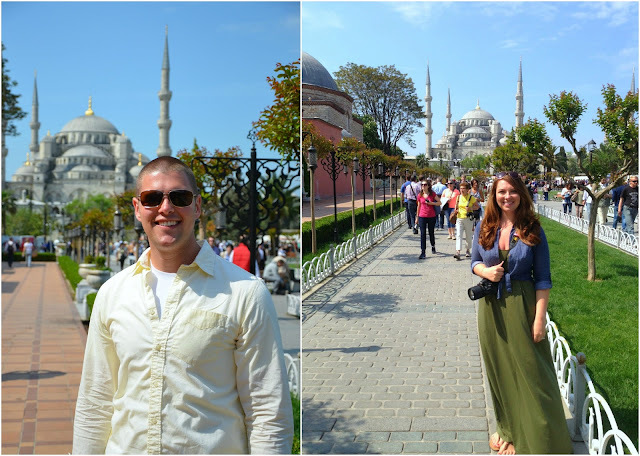 More from our visit to Istanbul can be found here & here! 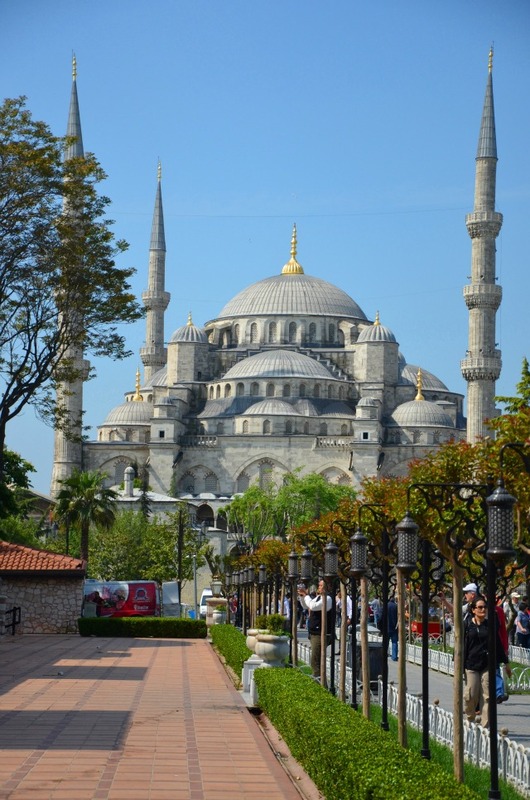 The Sultanahmet Mosque, more commonly known as the Blue Mosque, ranks high up there as one of my favorite sights in Istanbul. Before visiting, I'd been lusting over photos of this commanding mosque on Pinterest, imagining what it would be like to stand right before it. Or better yet, inside of it. 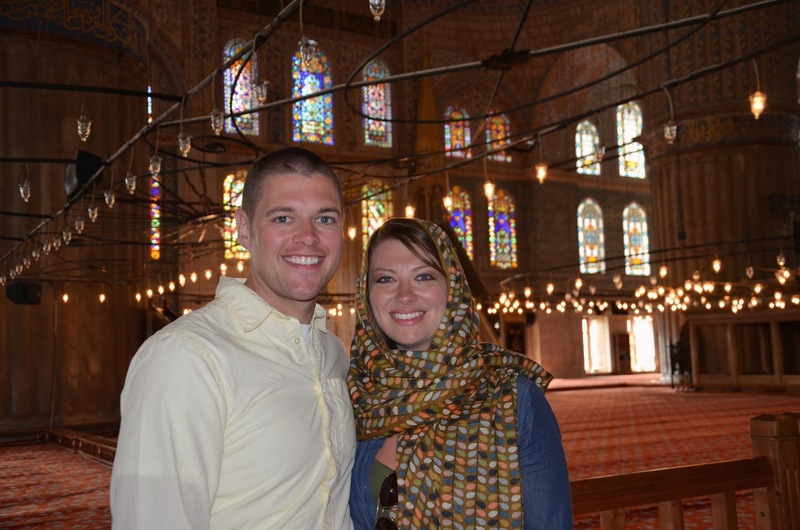 When we started our search for private tours, D and I knew this mosque had to be a part of it. 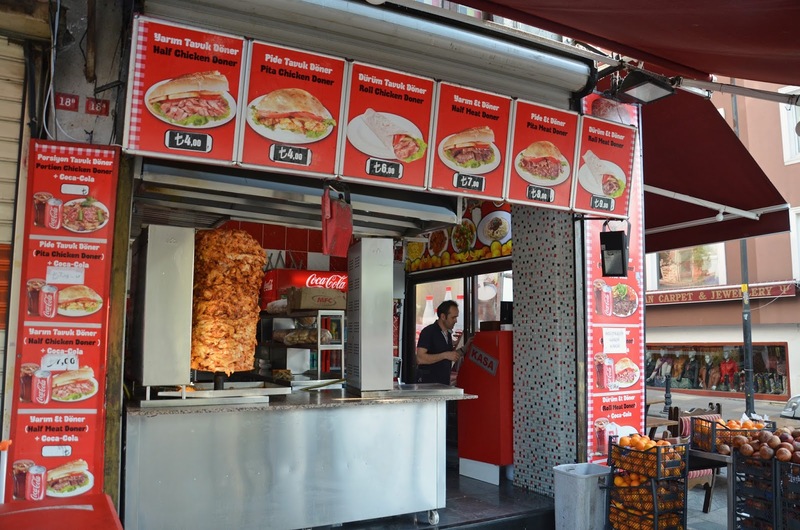 Happily, it ended up being our very first stop while exploring Istanbul. When we arrived at the doors of the Blue Mosque, we were kindly asked to remove our shoes. 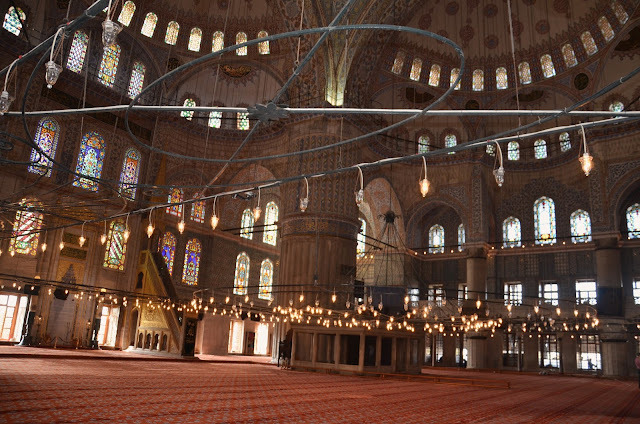 This practice is simply out of respect for the mosque and the people who pray in it. "Would you want to place your face to carpet where millions of soiled shoes have walked upon?," as Funda, our lively tour guide reminded us. Makes sense, so of course, we obliged (they give you a plastic bag to carry your shoes around in). 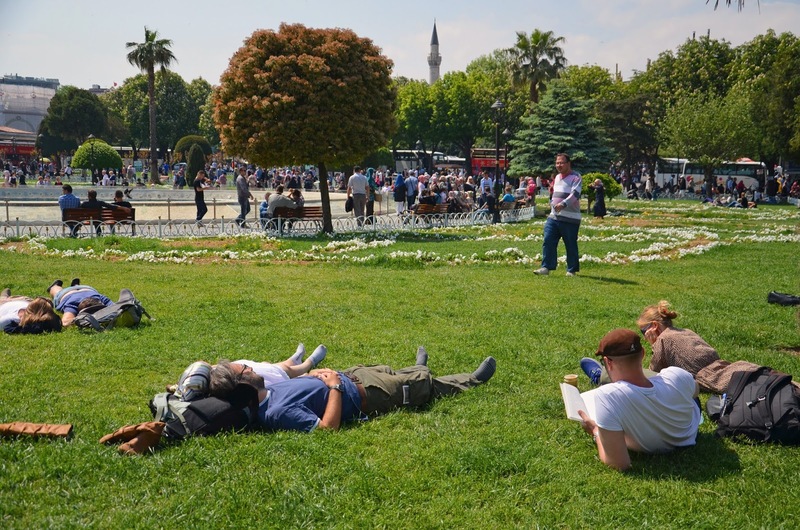 In addition, men were to cover their knees and ladies were to cover their heads, shoulders, and knees if exposed. 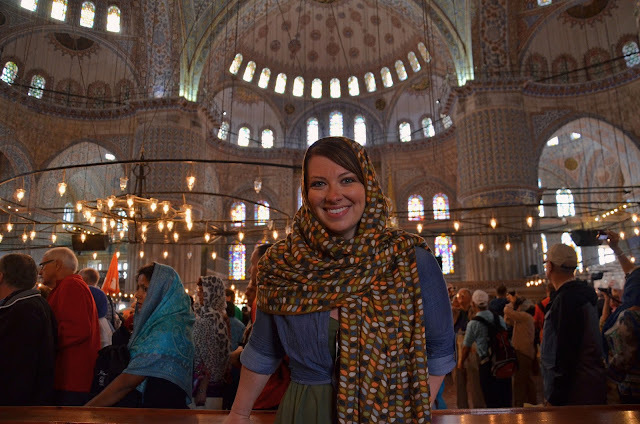 Because I knew this was common practice in mosques all over the world, I thought to bring my own scarf (color coordinated, of course!) to wrap around myself. If you didn't have your own, you were at the mercy of the mosque's loaner pashminas (Traveler tip: who knows who's head has been wrapped in those pashminas, so I'd advise bringing along your own!). They also had loaner sarongs if your knees were showing, but those looked a lot less grungy. After dressing the part, we all entered through the doors of the Blue Mosque, ready to be 'WOWed.' Add in a few more awe-inspired adjectives and that's how amazing this place was. 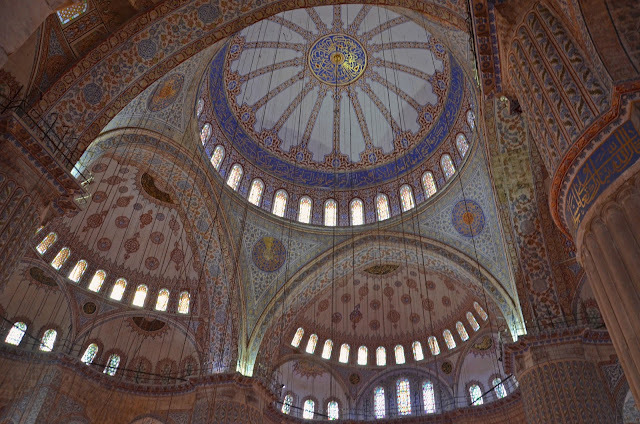 If you thought the outside was huge, the inside was even more palatial...and colorful. So, so colorful! 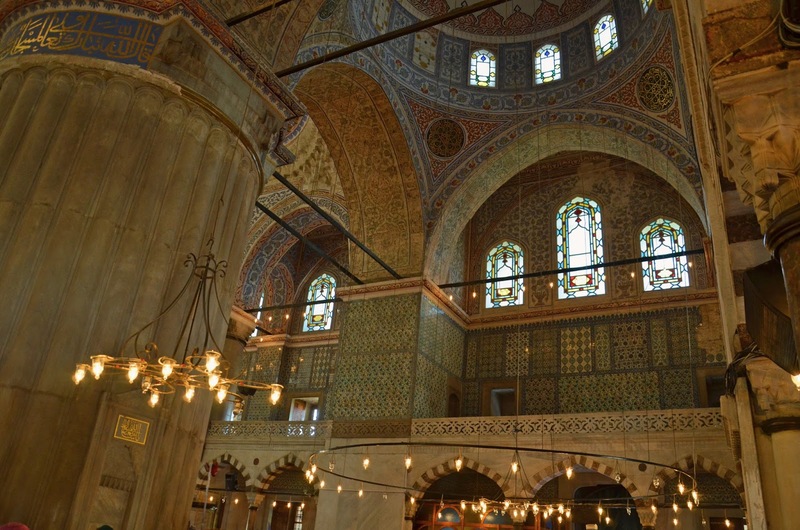 The carpets were rich with crimson, the walls covered in brightly patterned ceramic tiles, and cascading from the ceiling were giant, circular, wrought-iron chandeliers that gave the whole mosque an almost romantic ambiance. This was just about the time I started wishing for a wide angle lens, because it was impossible to capture the depth and beauty of this massive place all in one camera shot. The area where prayer occurs 5 times a day was blocked off to the public, but we could walk around almost every other part of the mosque. Thankfully, we got there before too many other tourists showed up, so we could enjoy the mosque without being agitated by being cramped together. 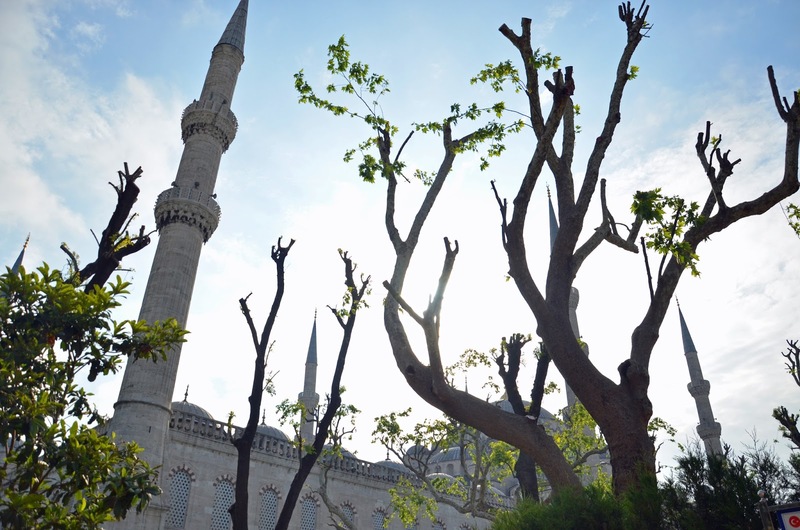 Funda gave us ample time to wander around on our own, then took us aside and explained the mosque's history and significance in the realm of Islam. --Women are asked to cover their heads and shoulders with a hijab (veil) out of modesty and reverence to God. 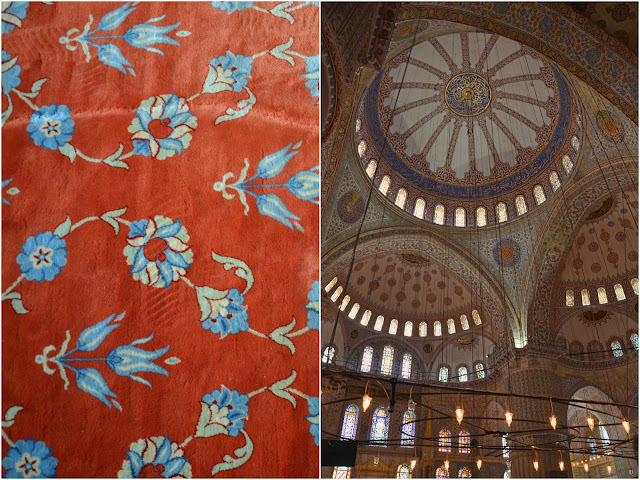 It is not only considered a physical body covering, but also embodies a metaphysical meaning. Al-hijab means "veil that separates man or the world from God." The Qur'ran instructs both women and men to dress in a modest way. --The pointy, castle-like spires that surround the mosque are called minarets. 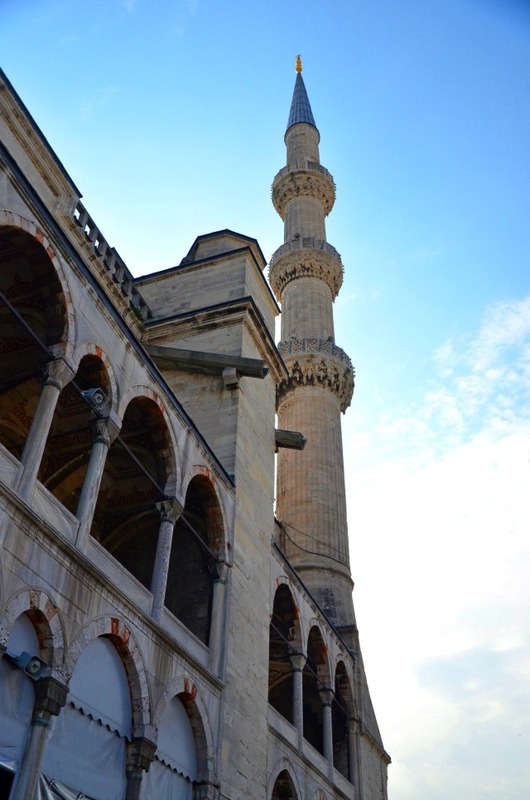 From these minarets, the call to prayer is announced each day. 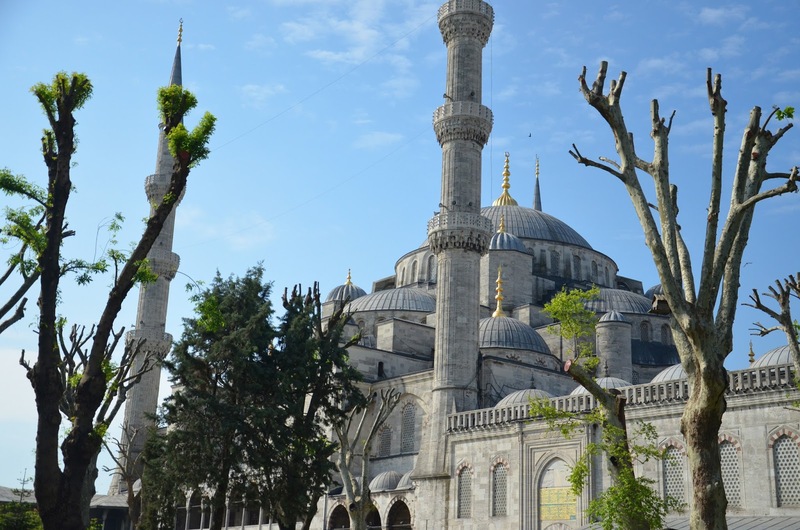 Most mosques only have 4 minarets, but the Blue Mosque has 6. This was a source of contention during the building process back in 1616. 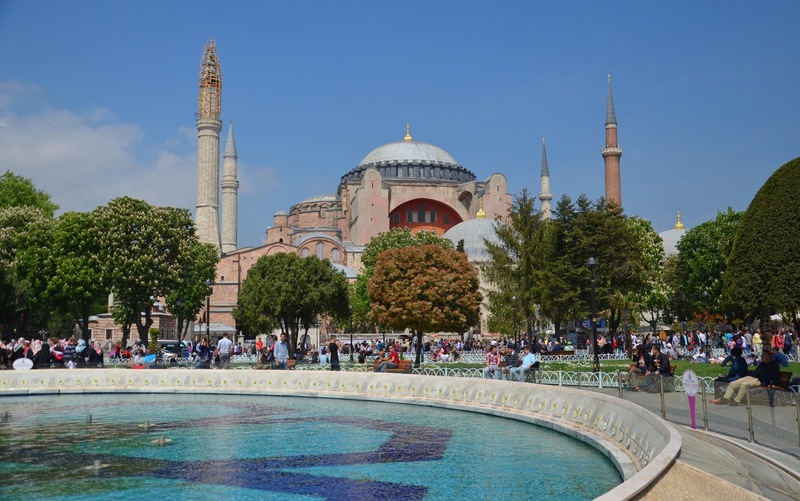 The former principle practicing mosque, Hagia Sophia, directly adjacent to the Blue Mosque, has only 4 minarets. --You can hear the call to prayer resound from various mosques all over Istanbul. The calls, while brief, literally engulf the city and can be heard almost anywhere. 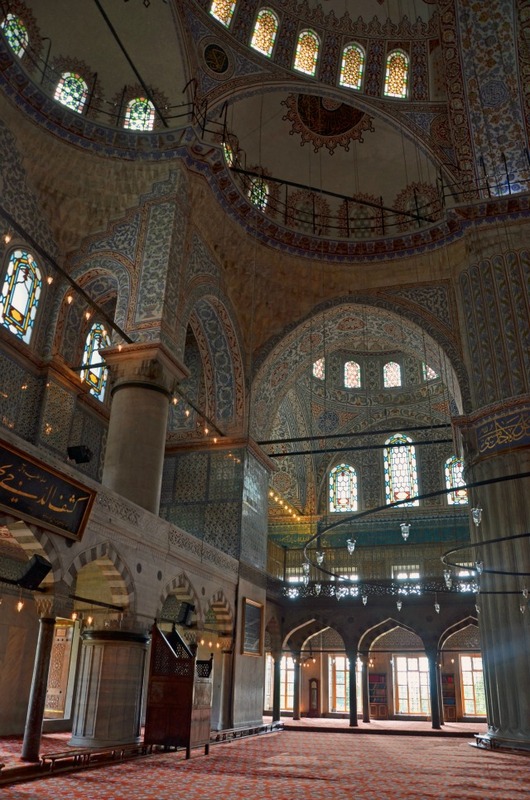 --The main hall is reserved for men to pray in only. 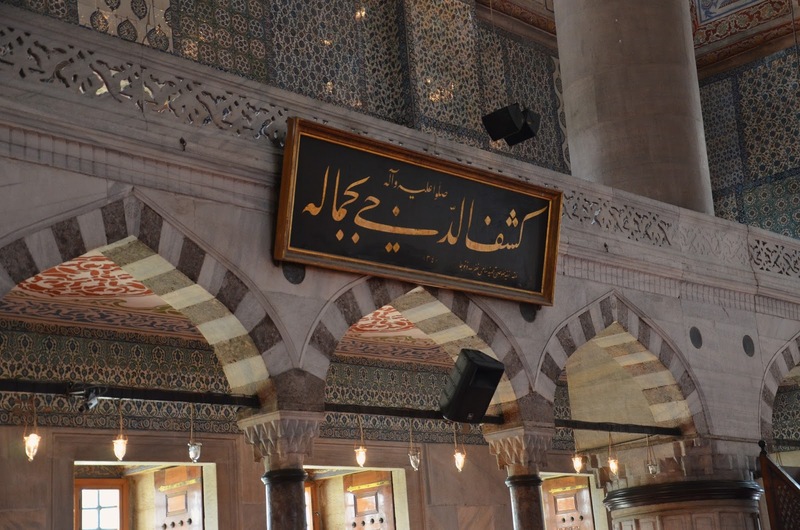 Women have their own separate section in the back of the mosque. This is not to degrade women, rather to accommodate their need to pray in private. 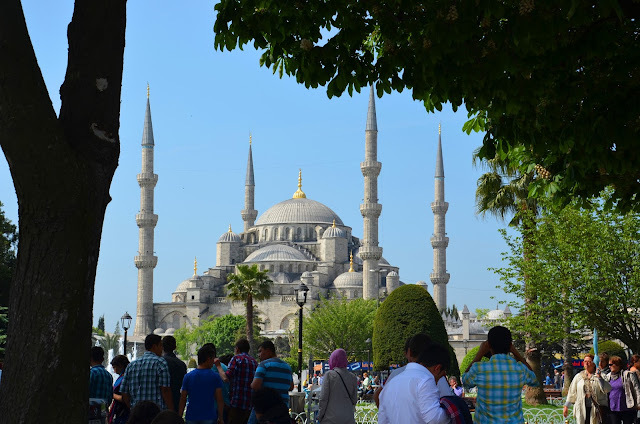 --Besides being a tourist attraction, the Blue Mosque is still an active mosque, closing to visitors for 30 minutes 5 times a day for prayer. --This video, by travel guru Rick Steves', provides a great overview for the Blue Mosque. Couldn't have said it all better myself, Rick. I have to admit, having to "dress up" (so to speak) and get a true physical feel for a traditional Muslim practice was pretty neat. 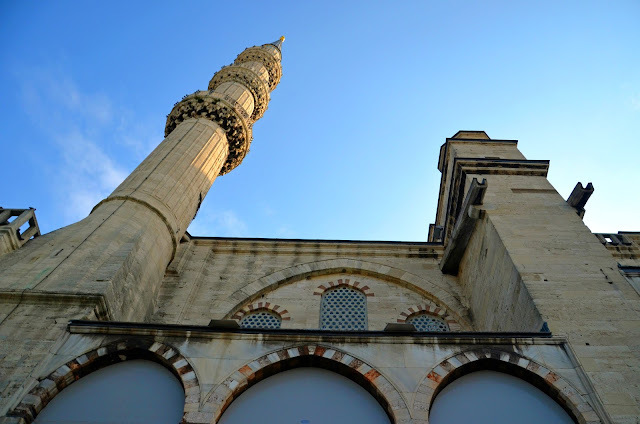 I only wish we could have been inside the mosque during the time of prayer. 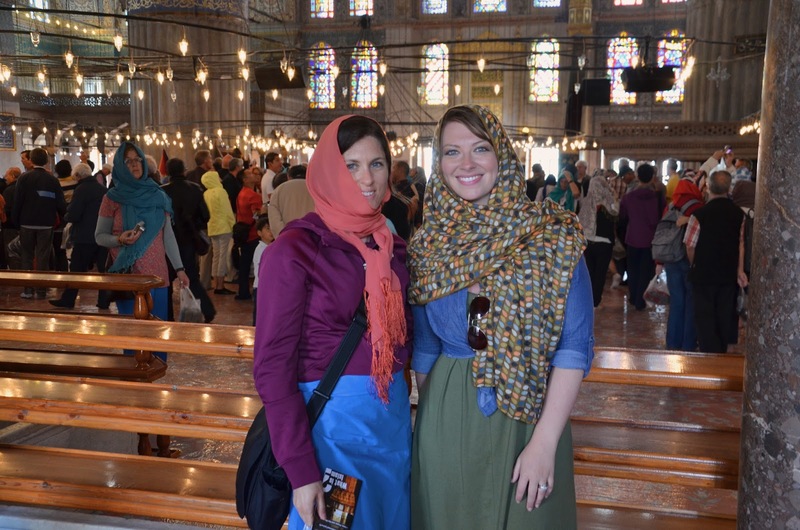 I would have loved to experience the mosque in that way as well. 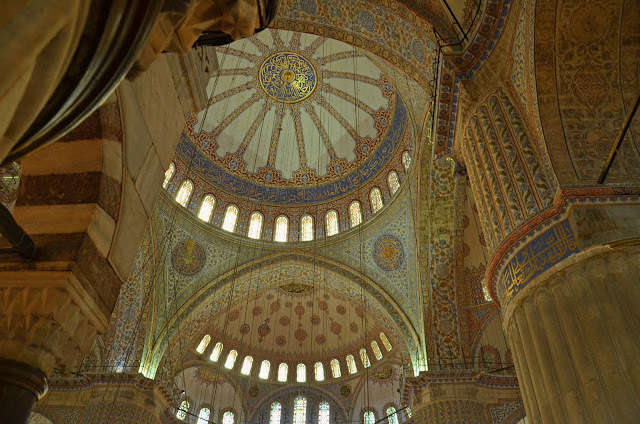 A few Aussie friends of ours from the cruise got to sit in on an afternoon prayer in a smaller mosque in Istanbul that day (Hi Keon-Cohen's!!). Lucky ducks! Color me 400 different shades of green with envy. Guess I'll just have to add that to my bucket list for another visit! As many of you know from reading previous cruise posts, Istanbul was one of the top cities we wanted to visit while cruising around the Mediterranean. 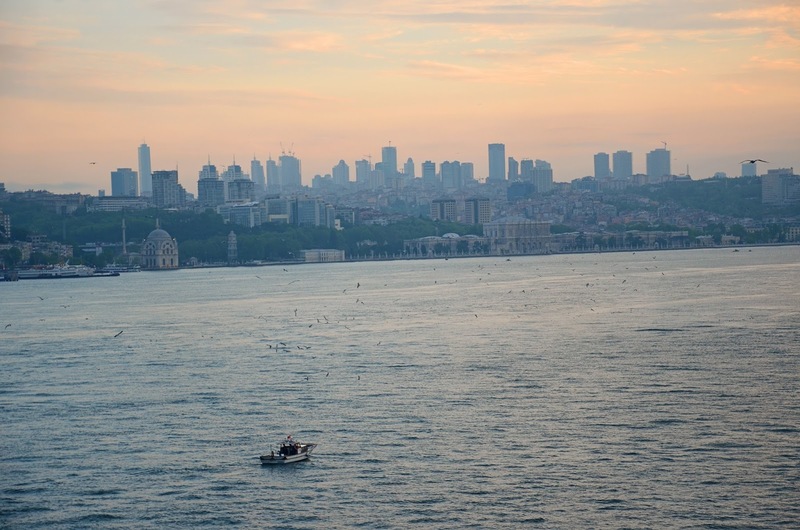 In fact, we probably wouldn't have booked a cruise at all if Istanbul wasn't included in any of the ports of call. 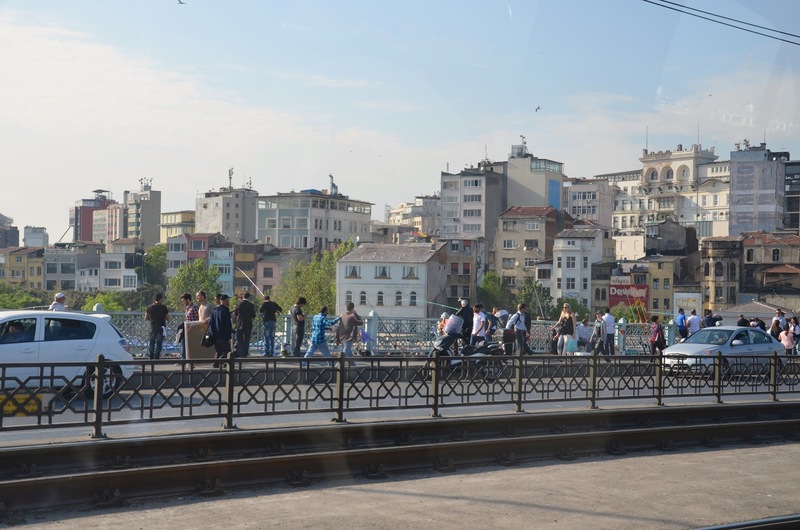 It's always been a city that's fascinated me; the culture, the long, complicated Byzantine and Ottoman histories, the architecture, the Islam religion, and of course, the rulings of the empire by various opulent Sultans. 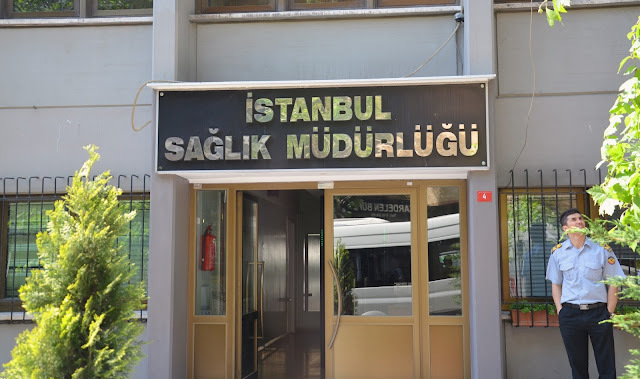 I swear, every street, mosque, and building in the entire city is named after one sultan or another. 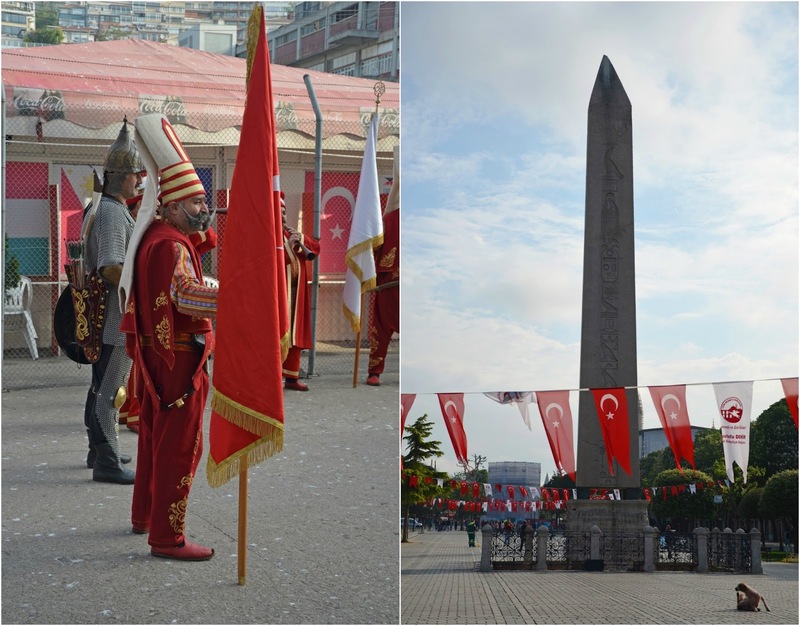 History is definitely alive and well in bustling Istanbul. Istanbul, formerly known as Constantinople (try getting that song out of your head now), the capital of Turkey for 16 centuries, is where East meets West...literally. 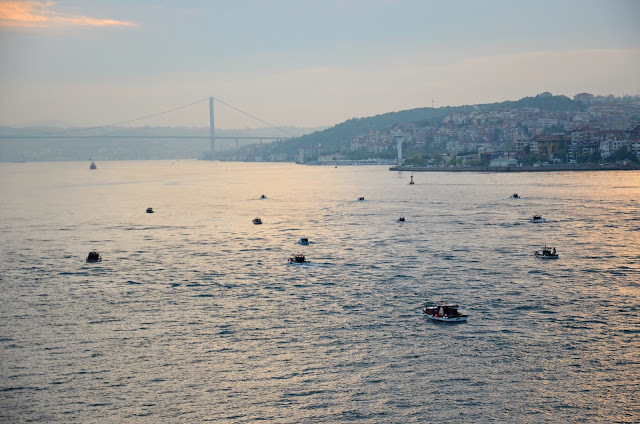 Divided by one of the world's busiest waterways, the Bosphorus, one half of Istanbul lies in Europe, while the other resides in Asia. 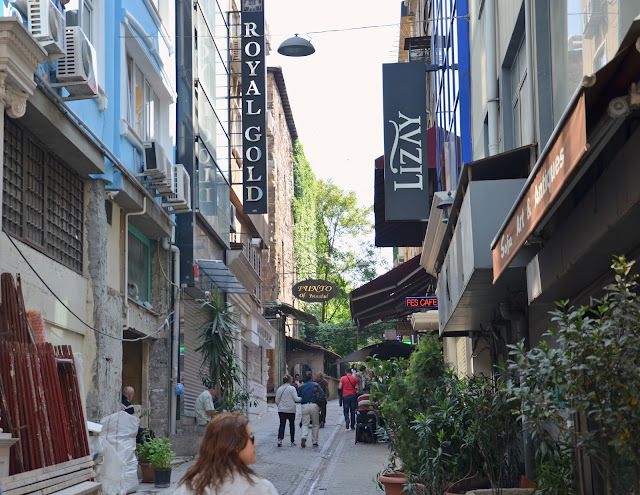 With the second largest population in the world (14 million, give or take a couple hundred), Istanbul is a far cry from the quaint and quiet Greek towns we previously visited on our cruise. 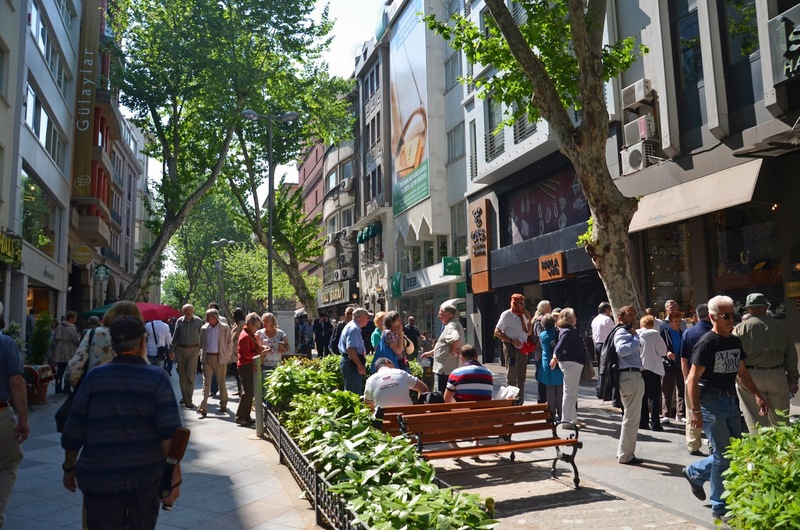 The European side being the most densely populated, it's Istanbul's historic and economic hub...and is also where we spent most of our time while touring this illusive city. Instead of going with one of the ship's overpriced and overcrowded tours, we opted to hire a private tour guide to take us around to Istanbul's most recognizable sights. 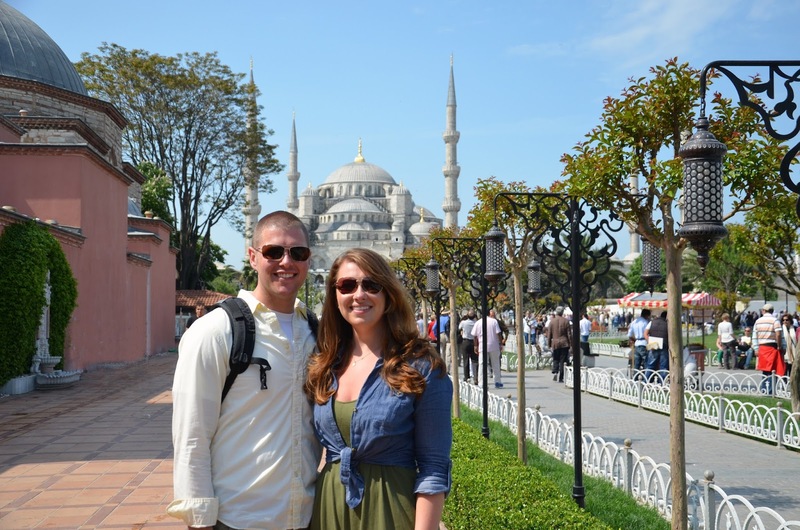 This tour was one we shared with 5 other couples who I met on the Cruise Critic forum and were also sailing on our ship. Our tour guide, Funda of KSG Tours, was an absolute delight and really knew her stuff. With only 1 and a half days to see all that Istanbul had to offer (our ship was docked overnight...which made our time there even more enjoyable! 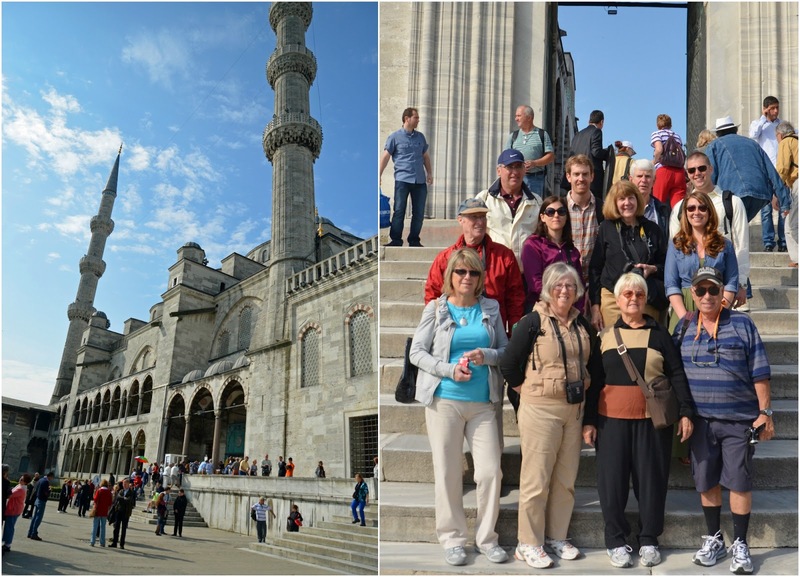 ), we couldn't have picked a better line up of sights, nor a better tour company to work with. Our day started bright and early at 6 am as we floated into the Golden Horn harbor just as the sun was coming up. D and I were both wide awake with cameras in hand to watch as our giant ship pulled into port. 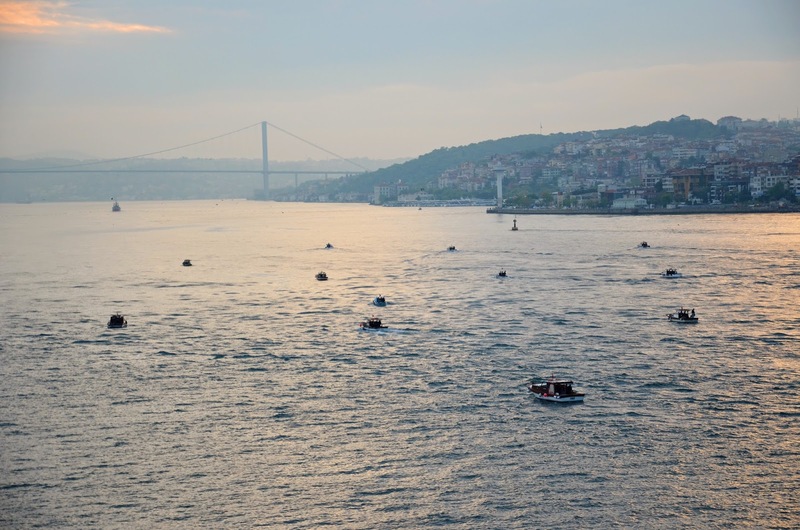 Compared to the quiet waters around the Greek ports we'd previously visited, the Bosphorus was crowded with early morning fishermen and freight ships passing through its strait. D and I ate our scrumptious room service breakfast from the comfort of our balcony while watching Istanbul come to life that morning. 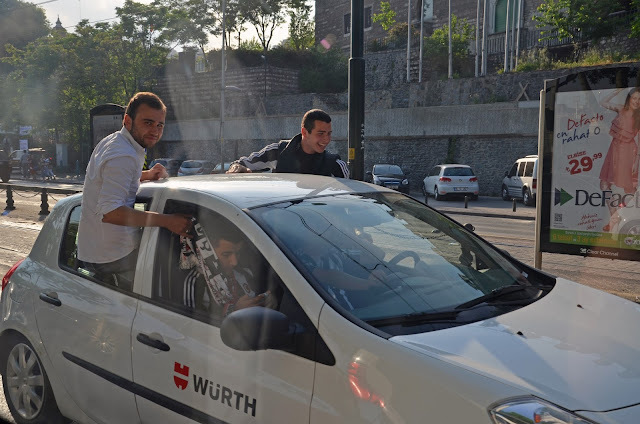 It totally got us both hyped up for what fun we had to come that day. 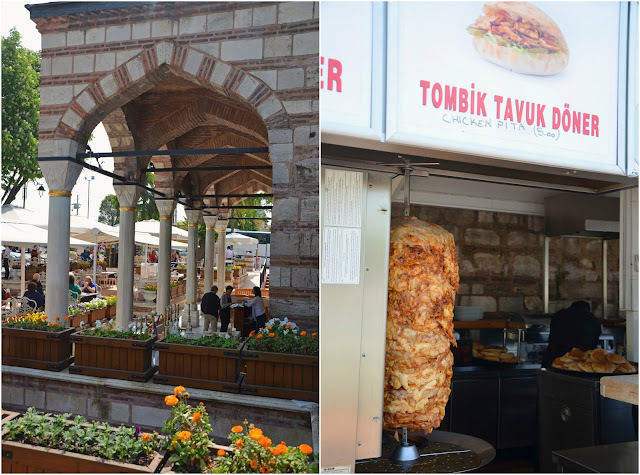 There is so much to show and tell you about our time here, so I'll have to break Istanbul up into a few posts. I'm sure you won't mind. 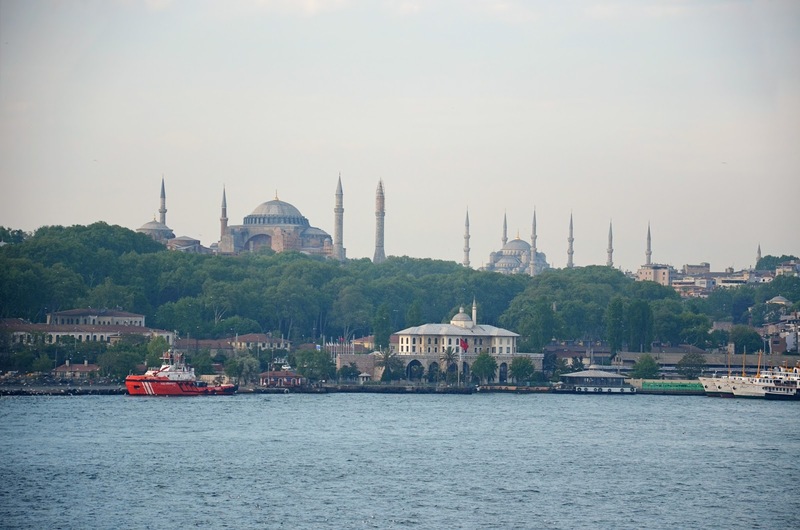 ;) Coming up...experiencing the Hippodrome & Blue Mosque! Happy Monday, dears! 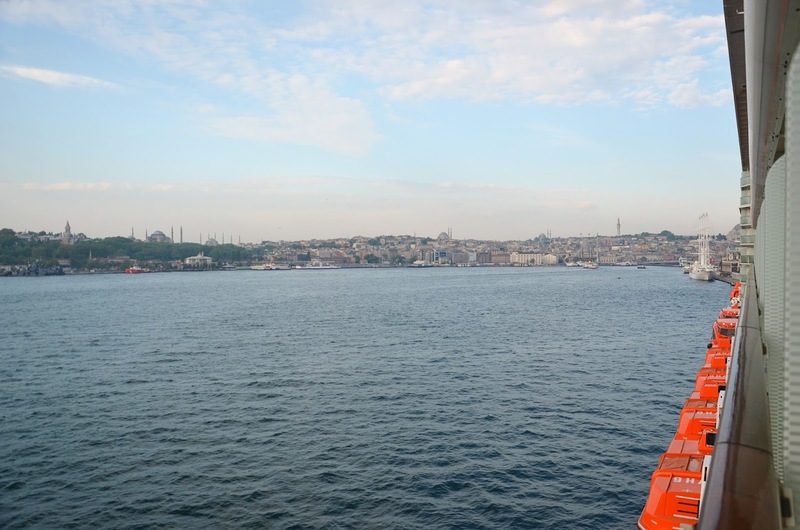 In case you've missed any of my Mediterranean cruise recaps thus far, you can play catch-up here! It's Friday, y'all! And you know what that means? It's FRESH FACE FRIDAY and I've got another duo of super cool bloggers that you need to get to know! As for me, I'm doing a whole lotta nuttin' this weekend. Well, nothing fun, at least. D and I have got to start packing for this cruise and clean up our mess of an apartment. One thing about traveling so often, your house always seems to be a mess. Ironic, because you're never there, but it happens all the same. Post-vacation suitcase explosions are the worst kinds of explosions, I've decided. I've yet to get a handle on that whole 'unpacking in a timely manner' thing. It's totally ok to unpack and repack in the same day, right? Anywho, enough about my lack of organization and cleanliness...go learn more about my new friends! 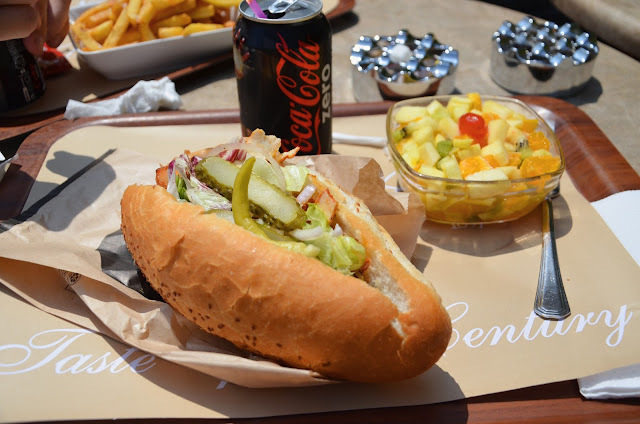 Happy weekending, dears! Dear friends, this is Mandi of the sweet and inspirational blog, All My Happy Endings. Mandi, aside from being ridiculously good-looking, is a loving wife and mom to 3 equally good-looking children. Seriously, this family is as photogenic as they come. Over at Mandi's blog, you'll find honest and thought-provoking posts about mommyhood, lots of fun DIY tutorials, and a refreshing look into the heart of a woman whose family is her world. 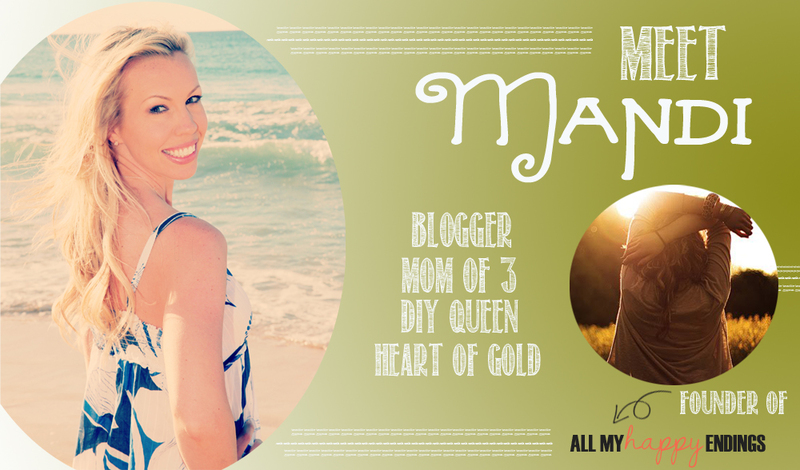 It's hard not to be drawn to her blog and her stunning heart of gold! Not to mention those gorgeous kids. I die! Mandi, if they're ever missing, it's because I stole them. ;) Mandi's got such an uplifting spirit and way with words that you must head on over get acquainted. She's got lots of love to share! The sweet chickadee above is Amanda. She's the spunky (and hilarious) gal writing to you from all the way across the world in South Korea! 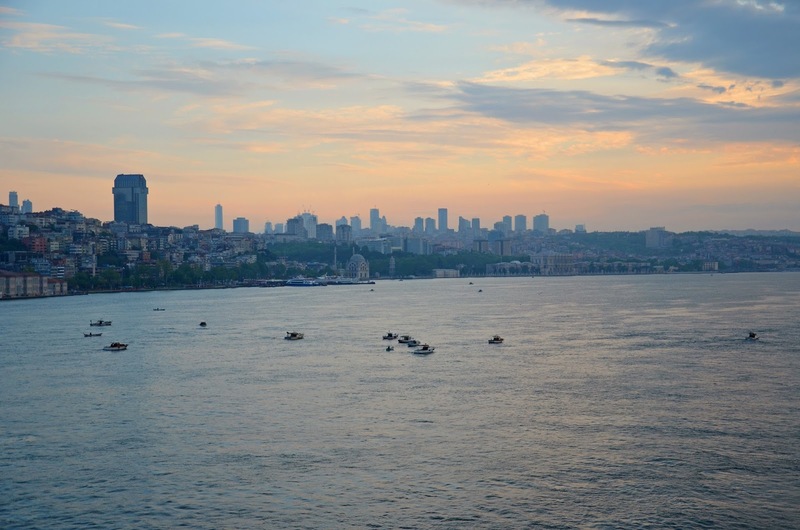 Over on Living in Another Language, you'll find lots of posts about navigating life as an American expat in Korea, gorgeous photos and recaps of her super fun travels, and some interesting looks into teaching English in a foreign country. I'm also kind of obsessed with Amanda's Weird Wednesday series. Wanna know what kind of strange things you can find in Asia? She's got you covered. The 'coupling outfit' thing is still cracking me up! Maybe I can get D to do that? (YEAH, RIGHT!) 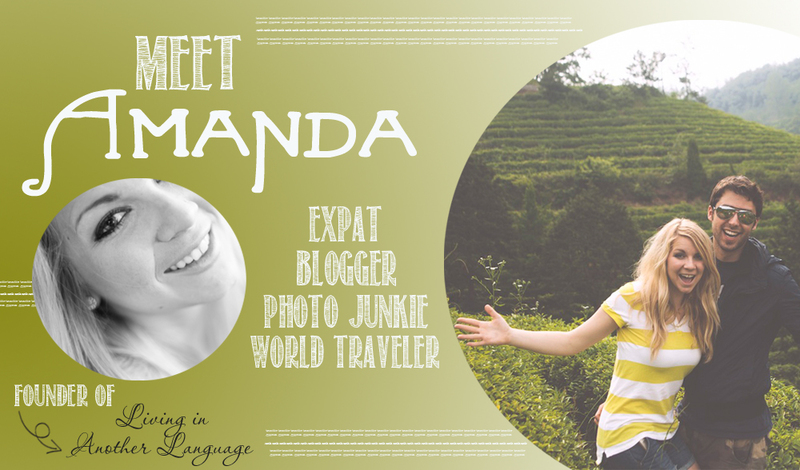 Friends, make your way over to Amanda's little slice of blog land and say hello! You'll want to stick around forever...promise! Would You Like a Cup of Tea With That? Want to get yourself featured on Fresh Face Friday? Click here for more info and to reserve your spot!